“Give J___ Auntie a string of flowers,” my mother-in-law told me. Suddenly I grew tense with a sense of not knowing what to do. 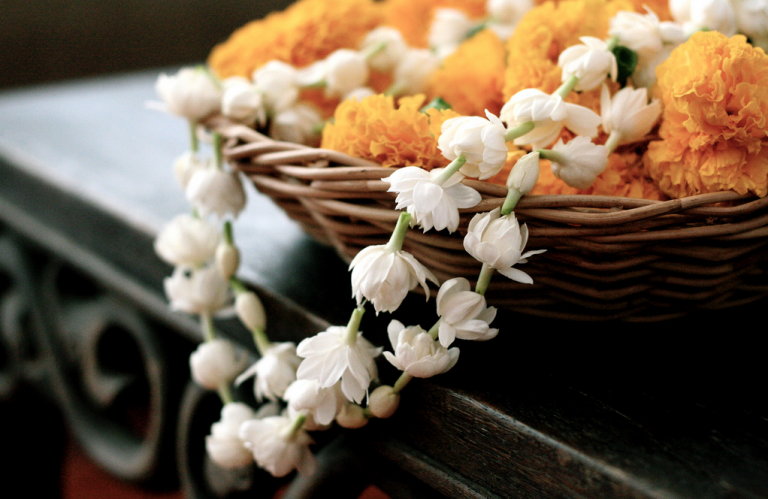 I had a long string of jasmines which I had cut into small pieces and was giving out to my daughter’s friends at her Sankranti party. My mother-in-law and a couple of her friends were sitting on the sofa. I busied myself in the kitchen so as not to have to respond to her instruction right away. Away from the crowd, I reflected, why had I become tense? I realized that it was because I was not sure how I could give flowers to J___ Auntie, while K___ Auntie was sitting right next to her. Then I realized that the solution was simple, give flowers to both J____ and K____ Auntie. Why had this obvious solution not struck me right away? Why had there even been a “problem” requiring a solution? 1) Why had she instructed me to give flowers to J___ but not also to K___ Auntie? 2) Why hadn’t she herself given out the flowers? For both questions, the reason stems from a distinction made between a married woman whose husband is alive and one whose husband is no longer alive. My mother-in-law had instructed me to give flowers to J___ Auntie because both of us fell into the former category. She did not give out the flowers, nor did she ask me to give flowers to K____ Auntie, because she and K___ Auntie fell into the latter category. I had no idea that that awful custom existed. Good job of squelching it! Lakshmi, wow! it is indeed amazing to hear about Auntie. Amazing! Lakshmi, I am so touched to hear this. And congratulations to Auntie! Even when no one tells, or maybe especially because no one talks about it, it can be very hard to silence the unspoken assumptions and risk wondering what people will say or think without saying. More power to the Aunties!